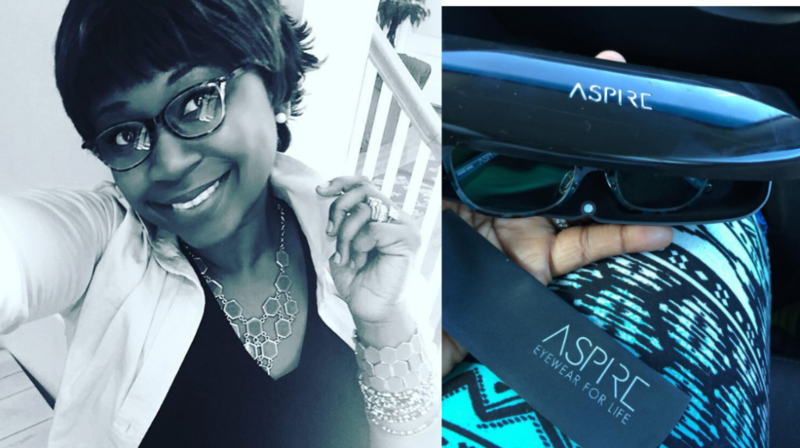 As a busy momtechpreneur who is constantly in front of a computer and experiences eye strain at times, I was excited to be given the opportunity to test out a pair of 3D printed prescription eyeglasses made by a relatively new brand called Aspire eyewear. Aspire is the brand of the vision wear company and retail chain ClearVision Optical. After getting an eye exam and faxing the prescription to the brand’s rep, a complimentary review pair of the style “Adventurous” arrived at the office. Off the bat, I was impressed that frames were fashionable and super light. The frames in this brand are made up of a new nylon polymer material called SDN-4 which is lighter in weight than typical plastic frames. The beauty of the 3D technology printing option is that the company can quickly develop a new series in 60 minutes compared to the 20 weeks it traditionally takes. Therefore, the company can stay on trend and quickly react to changes in design preferences or with emerging and new innovation. Consequently, the initial designs were based on 12 “personality-driven looks: Memorable, Dedicated, Unique, Outstanding, Expressive, Creative, Free, Independent, Powerful, Special, Stylish and Connected. Colors and style range from Boho-inspired florals and animal print designs for women, and modern, masculine, suiting inspired designs for men and women. Later versions included Poetic, Artistic, Romantic, Influential, Real and Wise. We were sent a pair to review and can certainly attest to the fact that they are indeed pliable and flexible. We tried out the Adventurous model and agreed it is very lightweight (the glasses are 22% lighter than typical titanium frames). The frames were extremely thin but durable at the same time. Throughout the review period of about two weeks, the glasses stood the test of daily wear. They are easy to clean and are attractive and eye catching. There is an adjustable nose pad as well with each pair. Aspire Eyewear is available exclusively at ClearVision retail locations. Suggested retail pricing for the brand ranges from $249.99-$289.99. That is a moderate price range and worth the price for the quality. The only thing that could have been better is the case that it came in is plastic and a bit on the flimsy side. Overall, they certainly are a pretty good bet.